I wanted to make something that I could share with my mom and would leave plenty of left overs!!! 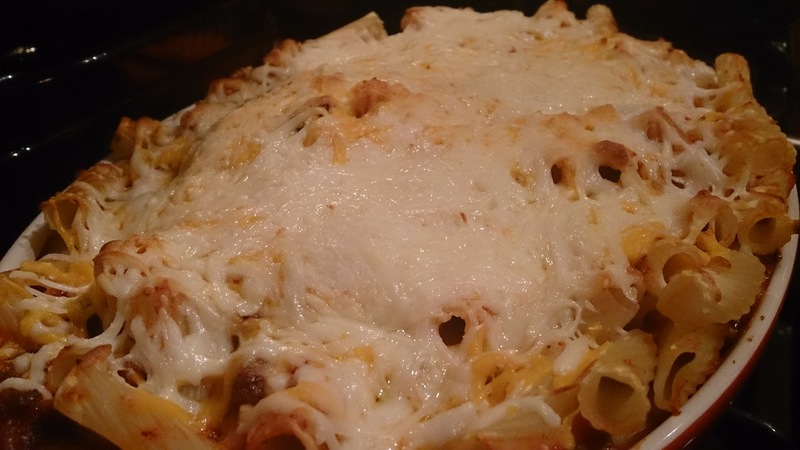 I feel like you can’t go wrong with pasta – I love to try new, simple, and most importantly budget friendly creations in the kitchen. 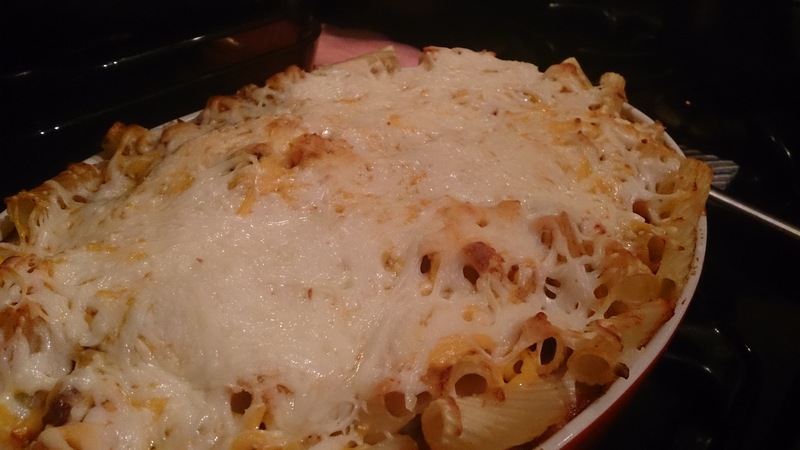 This time I knew I wanted to make a baked pasta dish so off to the local grocery store. 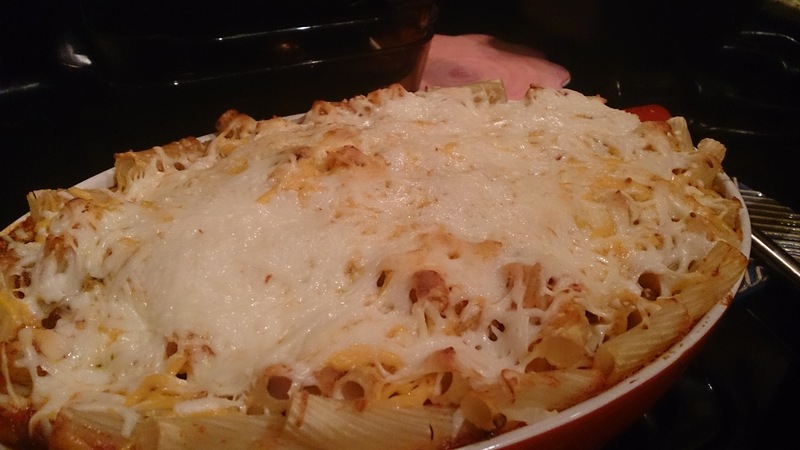 Below you will find an awesomely tasty dish and the step by step instructions with pictures for those of you that are new to the kitchen. Okay so – here’s what you’ll need! 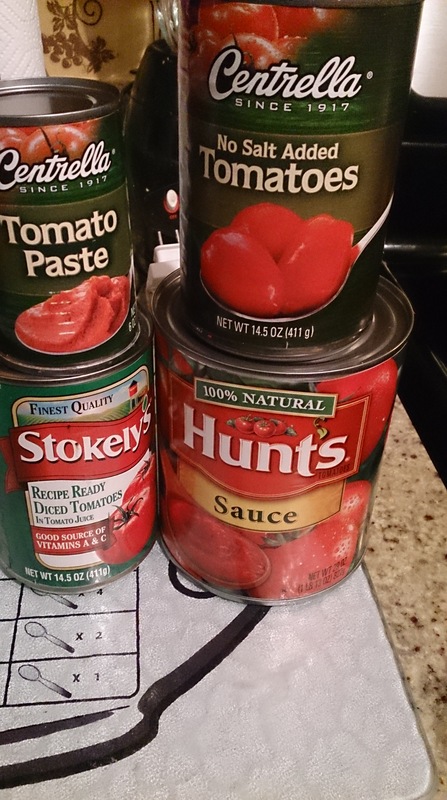 I ACTUALLY ENDED UP NOT USING THE DICED TOMATOES. 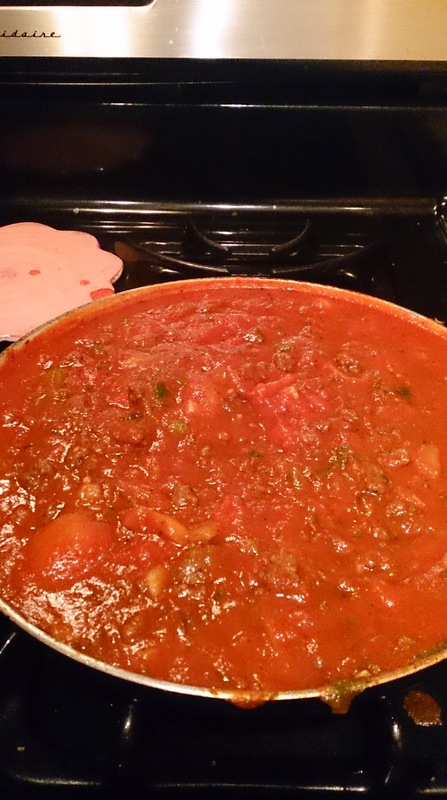 FEEL FREE TO USE FRESH TOMATOES – I’ve fresh tomatoes in the past and it tastes great too! I love this combination – you can usually find two for one deals. 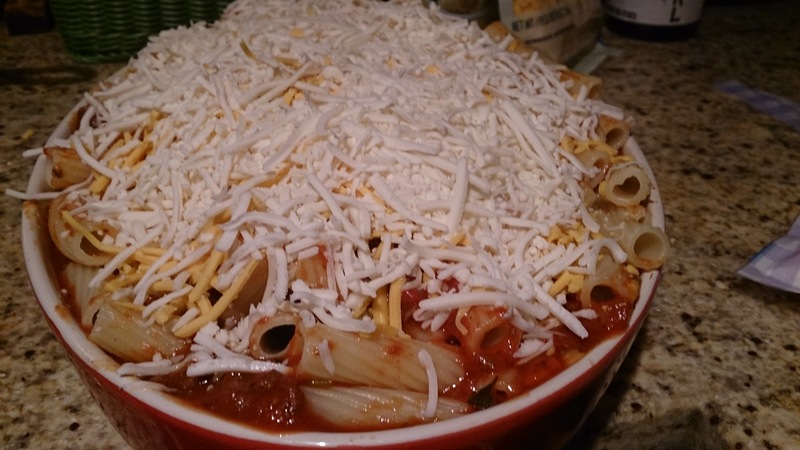 I’ve also used just mozzarella, you can also grate you own cheese. 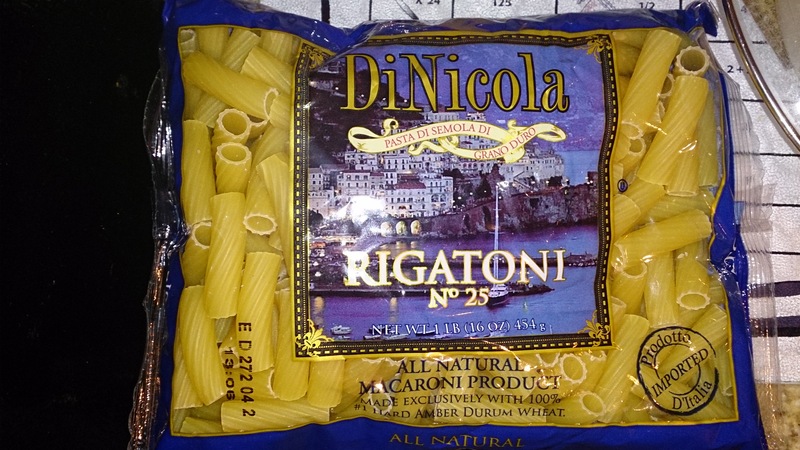 Use whatever pasta you’d like; wheat, homemade, gluten free (if there is a such thing)- this was on sale, I bought two! 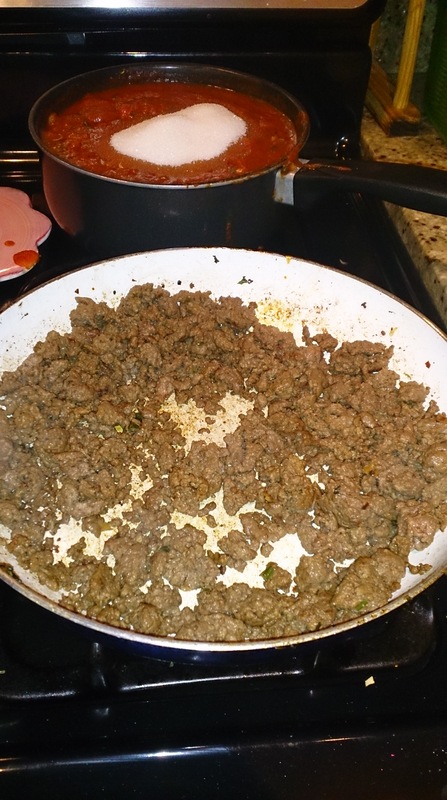 Ground Beef or whatever protein you’d like. I’m sure tofu would work..or just all veggies!!! 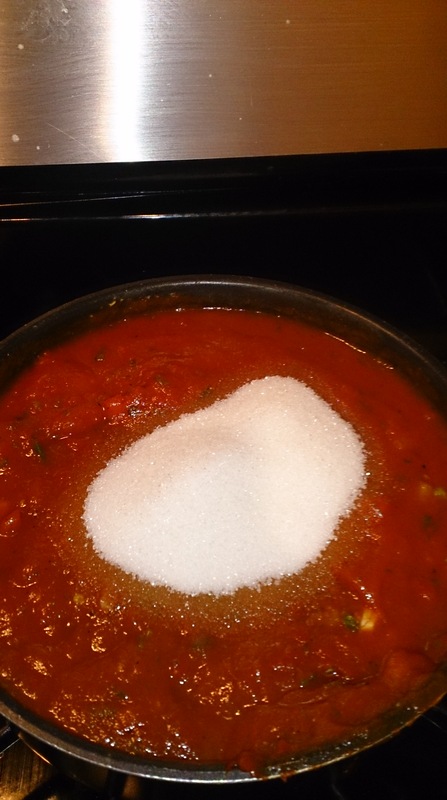 START BOILING YOUR WATER FOR YOUR PASTA!! 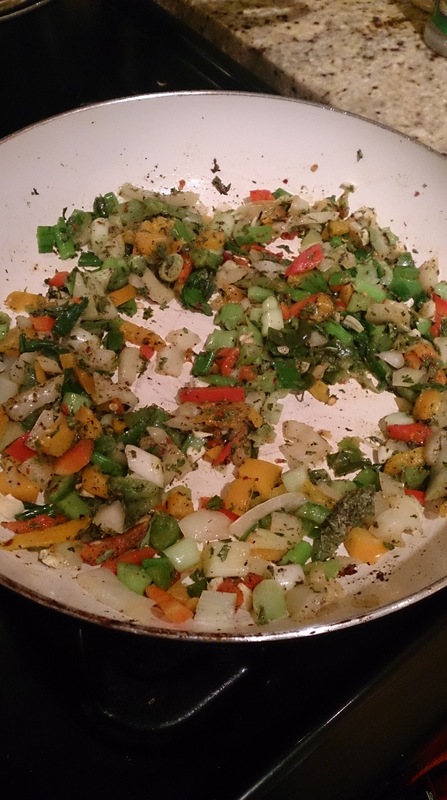 This is fresh yellow, red, and green peppers, onion, fresh garlic, scallions (green onion). Mix in all those good spice, I wish I had fresh thyme. 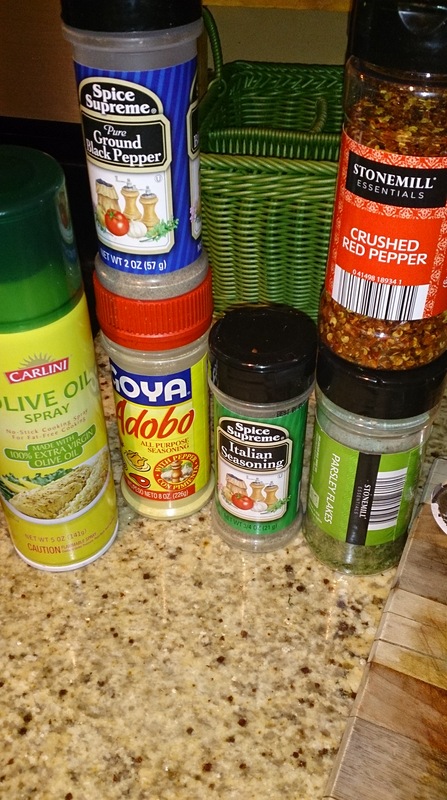 Feel free to add fresh spices, I am using things I already have. 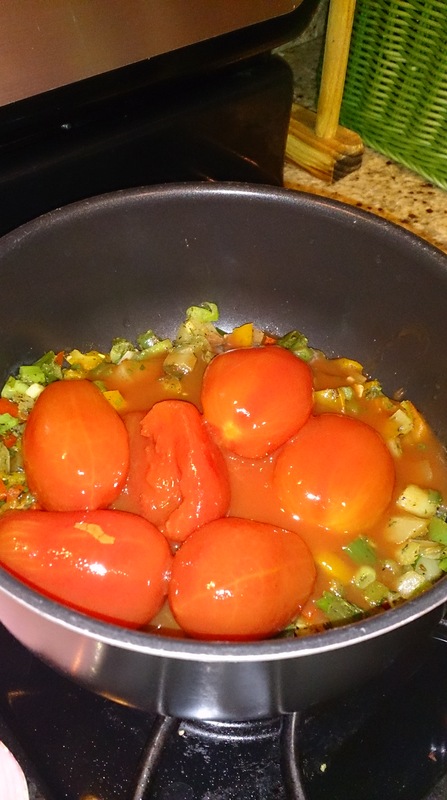 Once the veggies are nice and sauteed place them in a separate bowl. Brown the meat and be sure to drain it – I tend to drain as I cook. Remember to keep the flame at a medium setting. 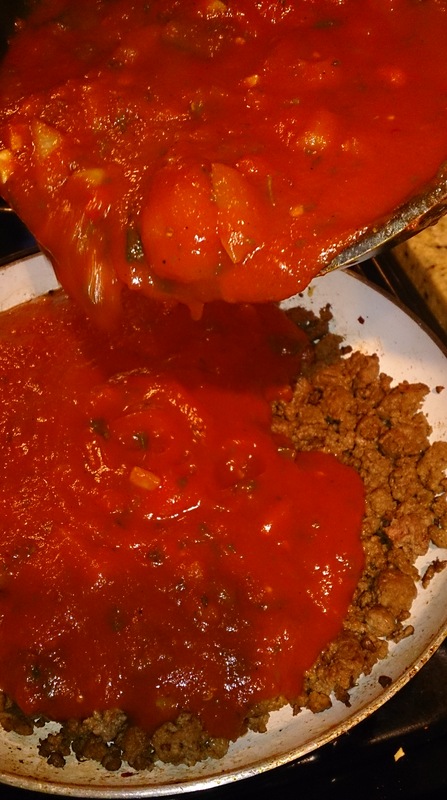 In a sauce pan add the veggies you sauteed and the canned tomatoes, the tomato paste, and tomato sauce. 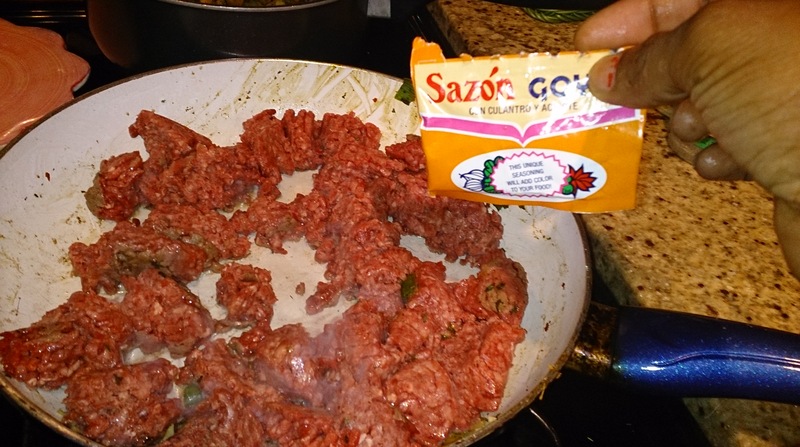 To cut the acidity and spice from the crushed pepper add a bit a sugar – ADD TO TASTE!! Your pasta should be done or almost done!! 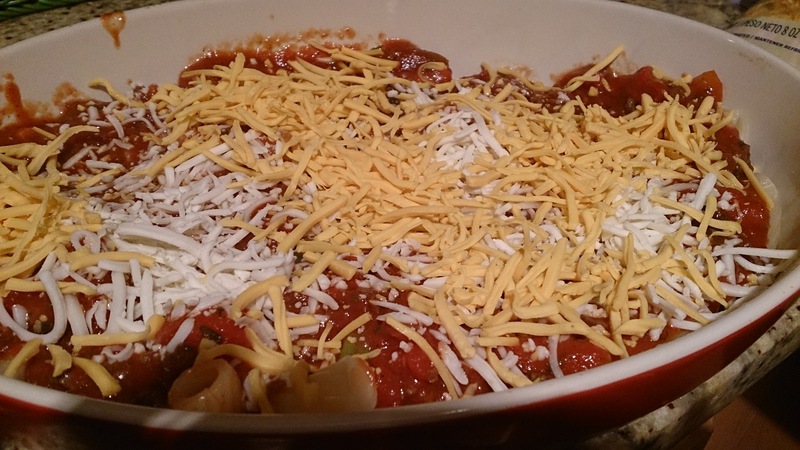 I like to build the dish like lasagna – base layer of pasta, followed by meat sauce, and topped off with cheese. Basically I continue that until I reach the top of the dish. 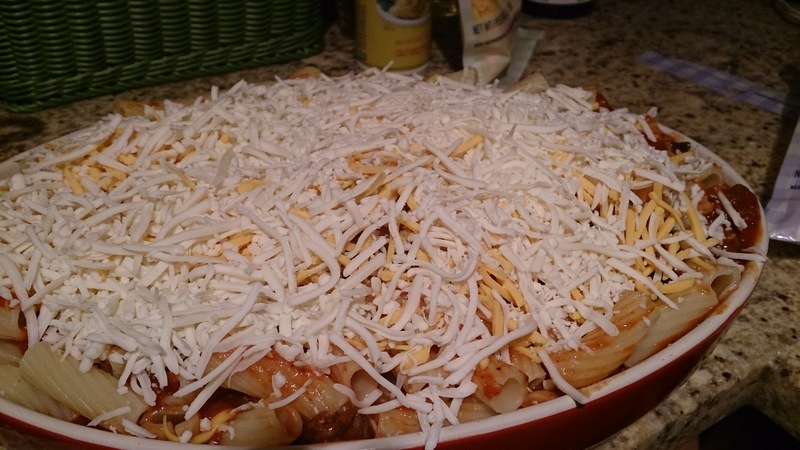 Be sure to leave yourself enough cheese to cover the top layer. Keep building until you reach the tippy top!! 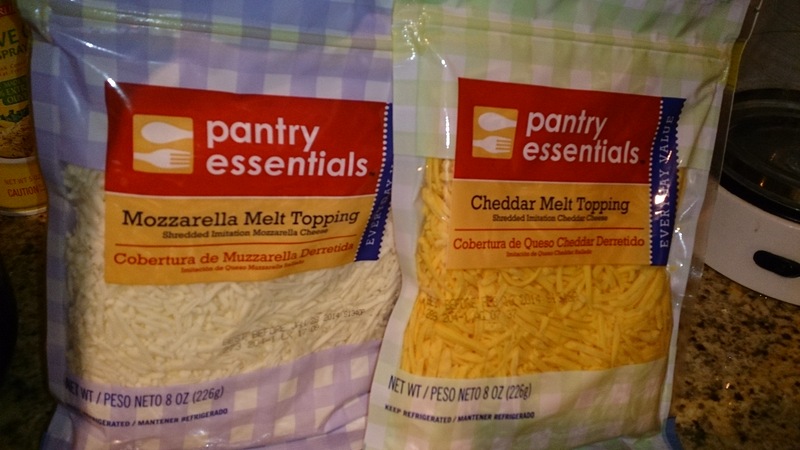 Bake until the cheese has melted – feel free to let the cheese get that nice caramel look. 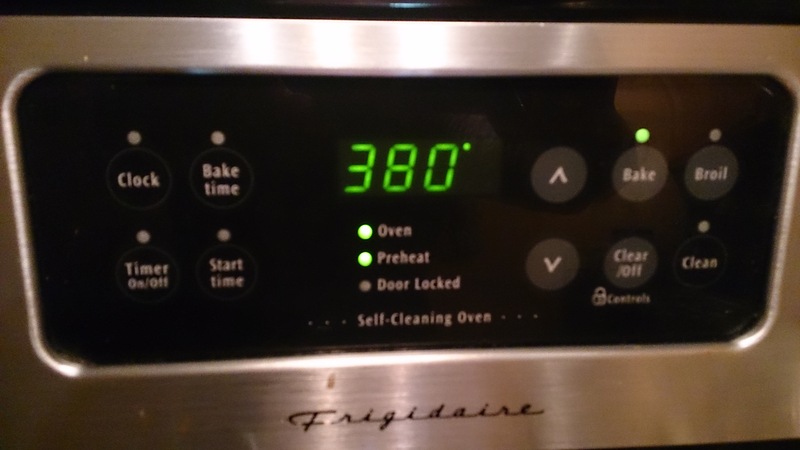 just be sure to watch it I set my oven for 20 min initially. After that, I check ever 5-10 min depending on my mood. SERIOUSLY THIS WAS SO GOOD AND IT WAS EVEN BETTER THE NEXT DAY … and the day after that, and the day after that …lol. 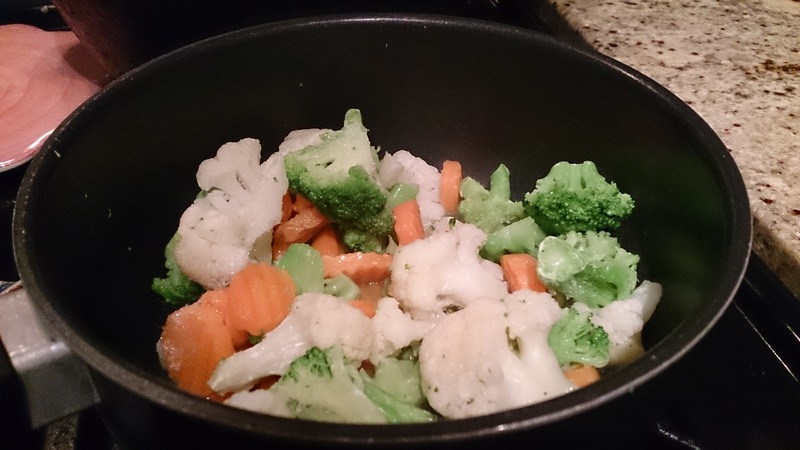 I also cook a nice side of veggies to accompany my pasta. I sometime make my own garlic bread but this time I had my King’s Hawaiian rolls. 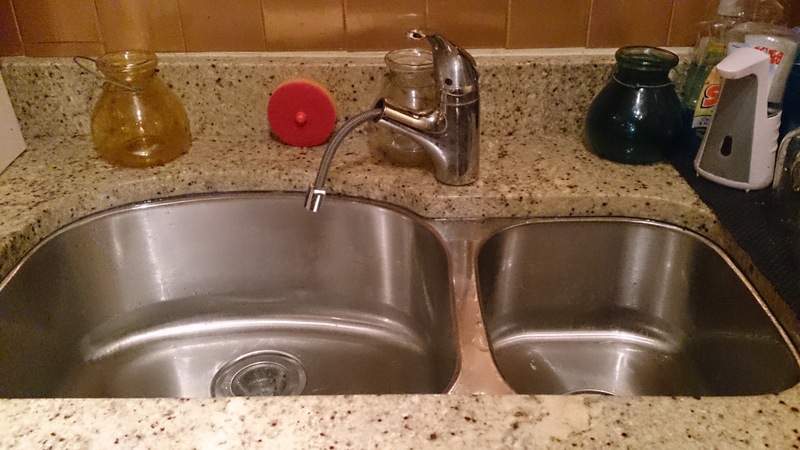 I like to clean while I cook – so that way all that’s left are the dishes I use for dinner. That’s it – if you have any questions or comments be sure to leave them below!! Let me know if there is something you’d like me to create on the simple and budget friendly tip!! On a side note, this dish is actually pretty healthy, and can be even healthier, depending on what ingredients you decide to use. You know exactly what you are eating…and the leftovers are so gooood. 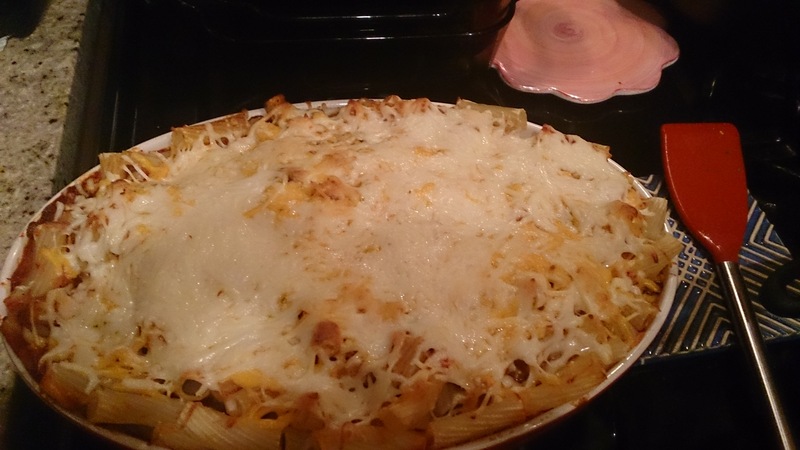 By the way, I looked it up there is gluten-free pasta … if you were wondering Ha!